MEXICO CITY — A political neophyte best known for playing dimwitted characters on his television comedy show won Guatemala’s presidential election on Sunday as voters overwhelmingly turned their backs on the status quo. The former comedian, Jimmy Morales, was leading with about 70 percent of the vote against Sandra Torres, a former first lady known for her social programs, with about 85 percent of the vote counted. But more than half of eligible voters did not cast ballots, an even stronger message of disgust with the country’s politics as usual. The election capped six tumultuous months in which a rising anticorruption citizens’ movement helped bring down a president. Running on the slogan “Not corrupt, nor a thief,” Mr. Morales capitalized on his image as a political outsider, setting himself apart from an establishment tainted by corruption. In the past six months, a United Nations-backed panel of prosecutors working with the attorney general has peeled back layers of corruption, uncovering myriad schemes to siphon cash from the country’s public coffers. As the list of officials and politicians accused in corruption scandals grew longer and reached higher, crowds began to assemble weekly in Guatemala City’s main square to demand accountability. After prosecutors named President Otto Pérez Molina as the leader of a plot to lower import duties in exchange for bribes, protesters demanding “justice now” forced him to step down on Sept. 2, as his last political allies abandoned him. A retired army general, Mr. Pérez Molina has been confined to a military barracks while pretrial proceedings continue. The scandals catapulted Mr. Morales into the lead in the first round of presidential balloting on Sept. 6. Aside from his television career, voters knew little about him. The broad humor of his long-running show revolved around recurring characters, including one in blackface and a Japanese prisoner of war. brutal civil war. 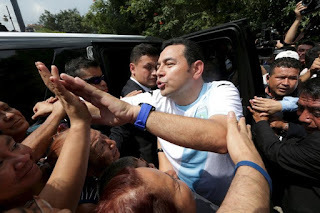 As Mr. Morales climbed in the polls, promising change, many in the business elite threw their support behind him, including the powerful confederation known as Cacif and the owner of Guatemala’s broadcast television monopoly. Despite his lopsided win, voters seemed less than enthusiastic about him. “I voted for Jimmy because he’s the least worst option,” Verónica Cruz, 22, a homemaker, said after casting her ballot in San Lucas Sacatepéquez, a suburb of Guatemala City. Crime and corruption are only the most visible problems besieging the economy in Guatemala. Income inequality is among the most extreme in Latin America, and almost half of the children are chronically malnourished. Mr. Morales will have to build coalitions among a deeply fractured Congress to pass any legislation. Watching his every move will be the movement that brought down Mr. Pérez Molina.